I feel like I owe you an explanation and an apology – it’s not like me to disappear for more than 2 weeks without at least letting my readers know where I am. A big part of me feels bad for not keeping you up to date with where I’ve been and how I’ve been but in all honesty, the past 2+ weeks have sucked. BIG time. I knew I was scheduled for a planned surgery on the 19th of December. I’m not going to go into too much detail into exactly why I had the surgery because I would like to keep certain aspects of my life private. The Specialist I went to see at the beginning of December said that I could either have the surgery on the 19th of December or in January 2015. He said that I would have to sleep over in hospital for 1 night and that recovery would probably be 2 to 3 weeks. He didn’t go into too much detail on post-op pain and discomfort and I understand why – a lot of people would probably have postponed the surgery indefinitely if they knew everything up front. I opted for the 19th of December because 1. I had NEVER been to hospital for an operation (except to have my wisdom teeth removed but one can hardly call that a proper surgery), so being the fool that I am, I was actually looking forward to staying over for a night in hospital. And 2. I honestly wanted to get the surgery over and done with as I have been struggling with SEVERE abdominal pain (on an on & off basis) for probably the last 16 years. Previous doctors diagnosed me with IBS, ovarian cysts, stomach ulcers (this one is true but not related to the surgery) and plain ol’ hypochondria. I figured since I have a high pain threshold, that I would be up and about within a week post-op. Stupid me thought I was different to everyone else, I thought I would heal very quick since I’m superhuman. No idea why I thought I would recover faster than the average human being – I guess it was my way of hoping for the best outcome. So anyway, fast forward to the 19th of December – I wake up early to arrive at the hospital at 8h00 (my surgery was scheduled for 11h00). I wasn’t allowed to eat or drink anything after 22h00 the night before, so you can imagine how much I was craving a cup of coffee. I remember sitting on my hospital bed BEGGING Neal to go get himself a coffee, so that I could sniff it. He refused because he knew it would actually make me crave it even more – he’s such a good guy. So at 10h45 the hospital porter came to wheel my bed into the surgery waiting area – thank goodness Neal & my mom were allowed to wait with me because the surgery ended up only starting at 11h30 as the surgeon was held up in another surgery. I can’t say I was very nervous leading up to the surgery, which is highly unusual for me as I am normally a very anxious person. I was trying to stay positive as I didn’t want to go into surgery with negative thoughts running through my head. The Anaesthetist (an old man, and by old I mean he resembled Dumbledore) came to meet me at about 10h50 and very kindly informed me that my Doctor was still in surgery, so we probably wouldn’t start at 11h00 as planned. He then said the following to me: “You know…I’m going to give you the good stuff that Michael Jackson loved so much. The stuff he took the night he died.” I remember just looking at this man and saying: “Cool, thanks…” I glanced over at both Neal and my mom & both looked a bit taken aback. Dr. Dumbledore then also went on to tell me that my high cholesterol was actually a good thing – apparently your body needs all the cholesterol it can get. It only becomes a problem if you’re obese, which I’m not, so he basically told me to stop taking my chronic cholesterol meds (nothing to do with the surgery by the way). Still trying to stay positive, I just said something like: “Thanks, I’ll keep that in mind.” To be honest, I didn’t want to get into a whole debate with him right before I was due to go in for surgery. The surgery was supposed to last for about 30 minutes but ended up lasting for 3 hours. There was no way for the surgeon to be prepared for the utter mess going on inside me and the surgery ended up being a lot more complicated than anyone expected, they also ended up removing my Appendix (which was not planned). Because of this, the Doc said I would need to spend 2 nights in hospital. Fast forward 3 hours – I wake up in the recovery room with 2 nurses by my side. I really thought I was in the ninth circle of hell. It felt like someone had dislocated my shoulder, broken my collarbone, stabbed me in the stomach, punched me in the ribs and to top it all off – I was finding it VERY difficult to breathe. I was groggy, I couldn’t speak properly and couldn’t tell the nurses exactly what I was feeling…all I can remember is I freaked out and tried to sit up (BAD idea!!) and eventually they gave me morphine & I passed out. The next few hours after surgery is a total blur for me, in fact, everything until the next morning is a blur. The only thing I do recall is the pain and discomfort – as mentioned before, I have a relatively high pain threshold but this pain was on a whole other level. Shoulder and back pain is apparently very common after this type of surgery, it’s called referred pain. Even with the amount of meds I was on, I couldn’t sleep the first night in hospital – I was super uncomfortable and in a lot of pain. I was unable to sleep on my side or on my tummy (and the foetal position is my favourite position to sleep in), so I was forced to sleep on my back. Meh… Not to mention I was still having trouble breathing, this lasted for a good 7 days post-op. I hate that this blog post sounds like a total Debbie Downer, but I just want you guys to understand exactly what I was going through and why I went MIA. Anyway, so I spent 2 nights in hospital and it was not at all what I expected (remember I said I had never been in hospital before and I like to experience new things). A phyiso also came to see me once a day to help me with my breathing and pain management. The service (sounds like I was at a restaurant) was pretty good but I was very happy to leave the hospital on the Sunday morning. Things were difficult when I got home because Neal and I initially didn’t know how to make me comfortable – he eventually created a super comfy area on the couch in front of the TV and that night he also turned our bed into a make-shift hospital bed that was comfy enough to sleep in but also offered support in all the right places. I honestly don’t know what I did to deserve this man. I had planned to load at least another 2 blog posts before the end of the year and also planned on filming a Christmas makeup look – all that was RUINED by this stupid surgery. Even though I knew beforehand that I would be recovering from an operation, I foolishly thought that I would be able to take photos and write a blog post or 2. I had the best intentions to be active on social media, post photos on Instagram every now & again but in the end I had no energy to do any of this, I was still in a lot of pain and to be honest: I was depressed. Christmas turned out being the worst Christmas of my life. I could hardly spend time with family because I couldn’t sit still for longer than 10 minutes at a time, and also couldn’t walk around for longer than 10 minutes at a time. Laying in bed (or on the couch) was most comfortable for me because I could breathe easier and the pain was not as intense if I lay down. Through all the pain, all the discomfort after the surgery I never cried once but on Christmas day I just couldn’t be strong anymore and I just broke down & cried – I cried for most of the day. As a result of me feeling the way I was feeling (I was a total grumpy grouch for at least a week and a half post surgery), I shut myself off from family, friends and social media & even though I felt like a failure for not recovering as fast as I had hoped, I also just didn’t care about blogging. I was feeling depressed and despondent. I was furious with my body for growing these ‘things’ that had to be removed in the first place, and was also angry with my body for not healing fast enough. ♥ Eucerin Aquaphor Soothing Skin Balm – this stuff is amazing to prevent scarring. I apply it to my scars every day and even Neal is impressed with how well my scars are healing. I also apply this to any dry areas on my body (heels, elbows and hands) – amazing stuff! I bought my little tube at Clicks. ♥ Oh So Heavenly Beauty Sleep Wish Upon A Star Soothing Pillow Mist – if you read this blog post, you already know much I love this pillow mist. Spending your days in bed can lead to the linen smelling a bit iffy (especially in Summer), so I used this to refresh my linen every day (don’t worry, it doesn’t stain the linen). You can find the Oh So Heavenly range at Clicks. ♥ Vichy Thermal Spa Water – I used this to refresh my skin during the day and it works like a bomb. It has been hot and humid in our neck of the woods, so misting my face with this has been a life-saver! Vichy Eau Thermale contains 15 minerals and leaves the skin feeling soothed & refreshed (and is suitable for sensitive skin too!). Uriage also make a great thermal water, both available at Clicks & Dis-Chem stores. 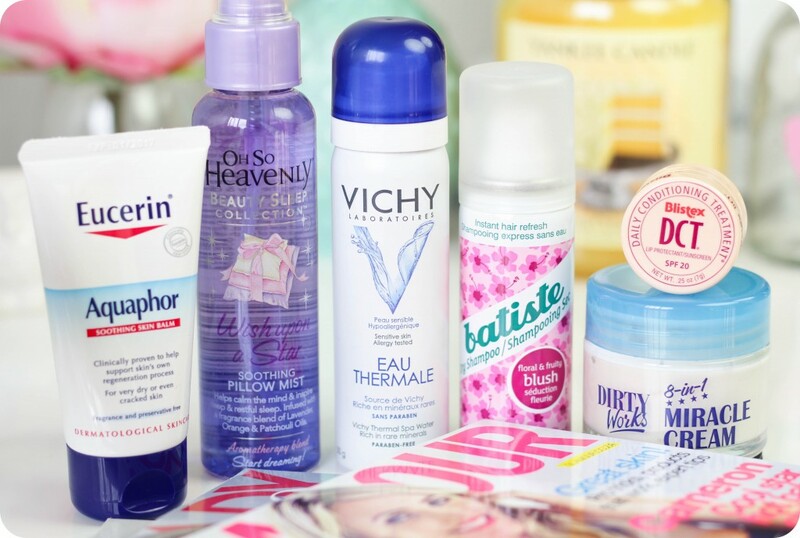 Vichy products are also available at Red Square, Foschini and Wellness Warehouse. ♥ Batiste Dry Shampoo – I was only allowed to shower 3 days after my operation, and third-day hair means super oily roots for me. Well…fortunately I had my trusty Batiste dry shampoo on hand, so not only were my roots looking fresh, my hair was smelling pretty darn good too! Batiste dry shampoos are sold at Clicks. ♥ Blistex DCT Lip Conditioning Treatment – I used this all day, every day. My lips were super dry after the surgery and this conditioning treatment really hydrated my parched lips. I also found the fresh minty scent was nice & refreshing. You can get this little jar at Dis-Chem or Clicks. ♥ Dirty Works 8-in-1 Miracle Cream – I’m not the type of blogger who raves about a product just because other bloggers rave about a product. In fact, I find it quite exciting when I DON’T enjoy a product while other bloggers have raved about it (it’s kind of like: “Yeah…I’m not a sheep!”). This super affordable cream (R 99,95 at Clicks) from Dirty Works have received some rave reviews from a few South African bloggers and with good reason. After my surgery, my skin care routine was basically non-existent. I wasn’t interested in applying serums, day creams, night creams, eye serums or eye creams to my skin – I had no energy to do it and frankly, I didn’t care. I decided to give this cream a run for its money since it can be used as a day- or night cream. It promises to improve skin firmness, brighten, even out skin tone, hydrate, stimulate collagen production, smoothen skin texture, fill fine lines and reduce wrinkles. It gives my skin a hit of hydration without leaving it feeling greasy or sticky. My skin feels smooth (almost like I’ve applied a primer) & healthy and the best part is, I can use it in the morning and at night. ♥ Books – I’m currently reading Jodi Picoult’s Leaving Time. 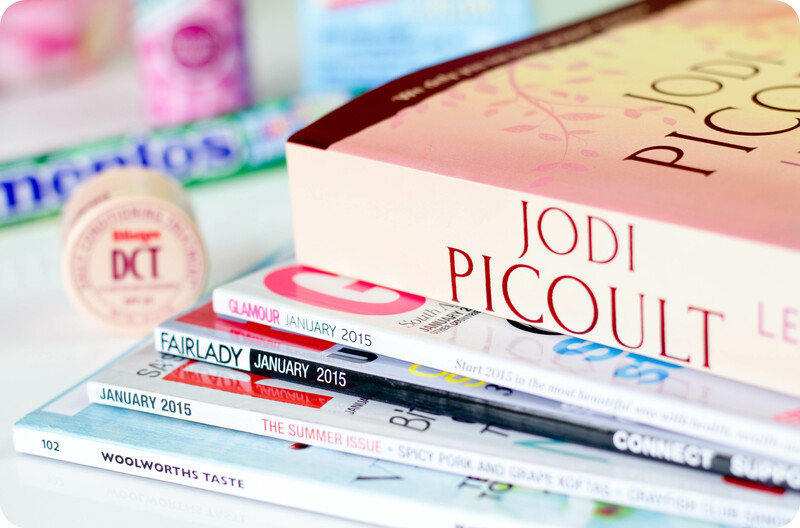 ♥ Magazines – my top picks are Fairlady, Glamour, Woolworths Taste Mag, Good Housekeeping, Your Family and Food & Home. ♥ Mentos, M&Ms and lots of water. Things got easier for me around the 14-day post-op mark when I had my stitches removed. The pain is a lot better (I only experience pain late afternoon / evening) and the discomfort is better too. My energy level is still an issue for me – I constantly need to take breaks. Take a shower. Take a break. Walk up the stairs. Take a break. Walk around the garden. Take a break. Make a sandwich. Take a break. My hair is also thinning quite a bit and I have noticed my short term memory has taken a knock but it’s apparently because of the anaesthetics and shouldn’t last too long. Insomnia is also an issue but I’m trying a few things to see if I can kick it to the curb. It is now 2 weeks and 5 days post surgery and although I’m still recovering, I feel a heck of a lot better. My Doc said I’ll only really feel 100% back to normal after about 6 weeks. I’m feeling more positive these days and will hopefully be back to blogging full-time again next week – I am holding thumbs! I am also DYING to film a YouTube video but at the moment I look like crap (dark circles and I just look tired) and I don’t have the energy for it yet. Thank you to everyone who took the time to check in on me via Twitter, Instagram and email, I really appreciate it so much. And a very special thank you goes out to Neal, my mom and my mom-in-law. Neal made sure I was always as comfortable as possible, my mom made sure I had a Bubble Tea to cheer me up on the really bad days, and my mom-in-law made sure we had food to eat (as I definitely wasn’t in any state to do food shopping or cooking). One thing is for sure, I never EVER want to go back to hospital again. It’s not the hospital so much but rather the whole idea of having a surgery again and dealing with all the pain and discomfort that goes along with it. So, if I ever have to give birth, I’ll be giving birth in the swimming pool here at home. …ok, maybe not… It will have to be one of those inflatable kiddie pools. Luzanne, you really are such a brave, strong, and amazing person! You’re still recovering, but you took the time to do a blog post about your experience, AND about profucts too! I’m thinking about you and hoping your recovery goes as planned and I have your care package ready to send! This comment just TOTALLY made my day…thank you SO SO much, Kristi! I’m so lucky to have readers like you who were constantly checking up on me on Twitter – you really made me feel I mattered (especially during that time when I was feeling super down and despondent). Goodness, Luzanne. It sounds like a horrific experience! I’m so glad you are feeling a bit better at least, and thank you for taking the time to write this post, it must have been very draining. That Doctor Dumbledore (love the name you gave him by the way lol) sounds like a weirdo. It was quite draining but I really felt like I needed to let you guys know where I’ve been and why I went MIA. I am so glad you are OK!!!!! I was really starting to get worried about you!!!! I hope you recover 100% very soon, L, and that the surgery was a success. Oh my god, I totally LOLLED at your last few sentences!!! OMG Luzanne, it sounds like you went through freaken hell and back! Sorry that you’ve not been 100%, I know what that’s like and the frustration you must be feeling to want to be back to full power, but healing is definitely needed 🙂 Im so glad to hear your back up and about though, was definitely missing your posts! Wishing you a super speedy recovery! Wow, this sounds so awful. So glad you are on the road to recovery and that you have good people looking after you! Sending you lots of strength for the next few weeks! You are the absolute best for writing this blog post even though you are not at full capacity yet. Thank you for posting this comment, Talitha – I felt it was about time I sat down to write a blog post just letting you guys know where I’ve been. Even though you just went through this traumatic ordeal you still find the humour and strength to joke about things. I wish more people were like you. Dit was ongelooflik hectic!! Ek is net bly dit is nou verby en dat ek hopelik gou weer behoorlik op die been sal wees. So jammer om te hoor dat jy deur so vreeslike tyd is <3 Ek dink aan jou en hoop jy voel sommer gou gou beter! I have missed your blog posts so much, Lu! Thank goodness you are ok and on the mend, I am keeping you in my prayers. Remember to take lots of fluids and rest. Thank you for your sweet words, Bonang. xo I’m drinking loads of water and have recently also started drinking ‘Ensure’ once a day to load up on Vitamins & Minerals and give me a bit of energy. Sounds like an awful ordeal. Be kind to yourself. …take it one day at a time. I am am huge Jodi Picoult fan….. been wanting to get Nineteen Minutes for a while now. Have not seen this one though. … is it good? Will check on Kalahari. I’ve also been miserable this festive season….feeling so sorry for myself with how ill I have been, but hopefully as time goes by I will start feeling like my own self again. ‘Nineteen Minutes’ was very good, I really enjoyed reading it. I can’t comment on ‘Leaving Time’ yet as I’m just getting into the book now. I’ll let you know what I think once I’ve read a little bit more. I LOVE Jodi Picoult, I own every single one of her books – have you read ‘Lone Wolf’? Really enjoyed that one too!! Lone wolf…no I haven’t. I was so obsessed at one stage…read about 6 books in a row. The Pact….and another one…the kid in the ice at the end…Oh my soul…broke my heart. I needed a break from the heartache. I just finished reading a book called Winter Garden that had me in tears. If ever looking for a new book to read, try it out. my kids…I have to hide my Lush stash. My 6yr old had a friend over one day. Apparently they decided to take a bath and she was so upset that she wasn’t able to find my Lush goodies (thank goodness!). My son (3) says: I want to bath in blue water with stars…..so guess what’s his fave? He he. Whenever she releases a new book, I immediately buy it and leave the current book I’m reading. I was reading Dante’s Inferno and when I went looking for another book (because I knew I would be bed ridden for a while) at Exclusive Books and saw Jodi’s new one, I bought it and started reading it. 😉 So…I’m pretty much still obsessed! HECK NO! I’m definitely staying on my cholesterol meds, I honestly don’t care what that doc things. He hasn’t even seen my cholesterol test results, so his words were like water running off a duck’s back. There’s nothing nice about hospitals or surgery – hopefully all this discomfort will be worth it in the end though. In the meantime, listen to your body and give yourself the time that you need to rest and recover. Happy to hear that you’re starting to feel stronger. You are so right, I have no idea why I was actually looking forward to going to hospital – I’m such a fool!! Wow, that doc sounds like a total freak. I have been so worried about you, I have been checking in on your blog every day since your last post and was starting to think something serious had happened to you, L.
Simone is right, who would let us know if you died?!!! Not that I even want to think about that. Im so happy to see you are blogging again, but take it slow no need to rush into things. As long as we see at least one blog post from you a week, I have missed you so much!!! Just know that you were missed, Luzanne. Sounds like you went through a terrible time, but I am so glad you are on the mend. Keep drinking that water and remember an M&M a day keeps the Dr away (especially that Dr Dumbledore, what an insensitive old man). Thank you, Veronique… 🙂 This whole experience is right up there with my 3 most horrible experiences of my life, but it’s like they say: What doesn’t kill you, makes you stronger. You are so funny, Luzanne, your blog posts are always so entertaining (even one like this one that should be serious and depressing)! So happy to hear from you again and looking forward to reading all your blog posts next week. Haha! Thanks, Clara – I try to keep it lighthearted here on the blog, no use in complaining too much about things that I have no control over (and something that will in the end improve my quality of life). Glad you are doing much better. Sounds really scary with all you have been going through. Lots of cupcakes and sprinkles your way. I’m definitely taking it easy, what you say is 100% true – most important thing right now is to build my strength and take care of myself. Thank God you are ok, was really starting to get worried. So glad you are recovering so well and I pray you will be back to full capacity soon. Absolutely loved this blog post, Lu! Great to know you doing well now..
Shame hun! I really hope that the rest of the road to recovery is much smoother and that it flies by. Also I hope that this surgery means everything has been sorted and that you are able to live a less painful life going forward. Sending you lots of hugs! You such a strong woman. Wishing you the best of recoveries. your positivity is amazing! You are so right, Gaelyn – pain does some pretty wild stuff to one’s mental state. So glad to hear you are recovering! I suggest you start planning a special treat for yourself for when you are 100% recovered to make up for the crappy year end. In the meantime put away that computer for as long as you need – now is the time to take care of yourself!! I am very proud of you, my Dear. You have been very positive through all of this, managing your pain, discomfort and uneventful Christmas(which you love so much) without becoming overly depressed and unhappy. Reading these comments puts a smile of my face and I can only imagine what an impact it must have on you, so thank you all for supporting Luzanne and helping her recover through your kind words. Just to help you understand what happened to you after surgery a little better, there is a “crash” that happens after you have general anesthesia. It can cause the type of depressed feelings and “down” that you experienced. I have had a number of surgeries in the last few years and each recovery is different, however I have had some type of emotional crash after each. Sorry to hear there was so much pain and trouble breathing. The other thing I will tell you is that it may take more than 6 weeks for you to feel back to normal physically. Anesthesia really knocks your system for a loop and it took me months after my last one to get back to feeling 100%. Just thought I’d share with you so that you don’t get too down on yourself if you don’t bounce back as quickly. Hoping your recovery goes well…and faster than expected! Thanks for posting this comment, Peggy – it definitely made me feel better about the whole recovery process and my emotional state. I’m so sorry to hear you have had to undergo a number of surgeries in the past years, I hope you have recovered well and that you won’t need to go in again anytime soon. I was missing your posts! Thanks for giving us an update. I am a doc myself and think my colleagues behaviour is unprofessional and uncalled for. Maybe he was so flustered by your beauty that he pulled out his stupidity hat ;-). Good luck with the recovery process! Thanks for helping our South-African girls to stay as beautiful as always! Thank you for taking the time to read my blog, Melissa, I really appreciate it so much. So sorry you had to go through this Luzanne! Strongs!!! Eeek! I haven’t had ANY surgery and was hoping to permanently keep it that way. Well, ok at least till I was 50 and one of the reasons I’ve been avoiding the dentist for the last coupla years. One thing I hope I’ll be able to do before I do go under is chat to my anaesthetist and change if I get a weird vibe, such a shame that you got stuck with Dumbledore. Glad to hear you’re feeling better and you realise that you had post op blues. No apologies should be needed if you had unplugged for 2 weeks to spend time with what sounds like a loving and supportive family and definitely not for recovery from surgery especially when it was 6x what you were prepared for. Take it easy, try not to expect too much from your body too soon and holding thumbs you feel better and stronger every day. PS Thanks to my conscience and you I actually made it to the dentist the other day. This one actually says it’s not as bad as the other scare mongering dentist said. But yeah I was rewarded with a filling for my avoidance. Anyhoo just wanted to say thanks. Bringing bubble tea was only a pleasure and done with lots of love. Felt quite helpless seeing you in such pain and I know you can handle a lot. But now things can only get better! Thank you for giving us such an honest post about your whole ordeal. Here’s to wishing you a healthy recovery, you have the time, so make the most of it! I’m so sorry you had to go through so much pain. Thank you for letting us know about your experience. It is so nice to hear about how supportive your family has been, they are truly amazing. May you heal soon Luzanne. Hey Luzanne, only just reading this. Wishing you a speedy recovery!! On a side note, you write beautifully… so descriptive, i can almost imagine the pain. I recently also had a surgery so i can understand your pain. You are lucky to have a great husband to support you. And he is too cute with his comment on this post too. Wishing you the best year yet and looking forward to all you have in store for us readers this view. He’s definitely a keeper, that’s for sure! Good luck with your recovery. Soon it will be something of the past. Thank you for sharing your story with us.